Enjoy 3 for 2 on First Aid Beauty. The cheapest item will be discounted at the basket. Offer valid for a limited time only. 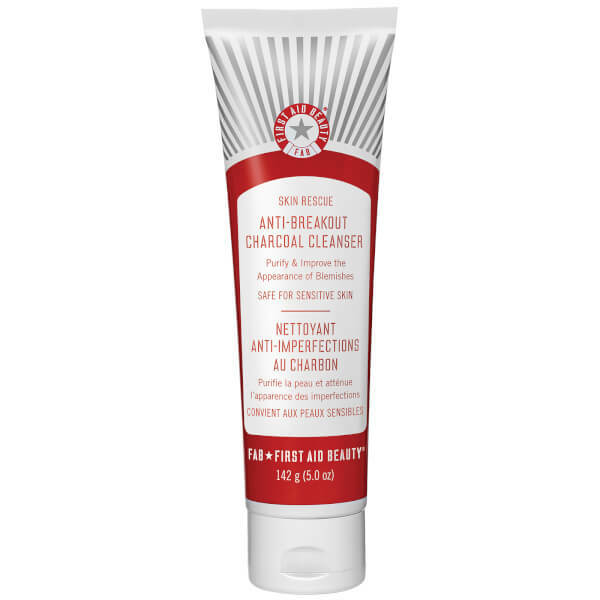 Keep breakouts at bay with First Aid Beauty Skin Rescue Anti-Breakout Charcoal Cleanser; a daily medicated formula that works to promote a clearer, brighter complexion. Fortified with Active Charcoal and Maximum Strength (2%) Salicylic Acid, the cleanser effectively draws out toxins and impurities from below the skin's surface. Bentonite and Kaolin Clays decongest skin, whilst Yoghurt Extract and Probiotics eliminate acne-causing bacteria. Expect a smoother, more refined visage with a healthy glow. Suitable for sensitive skin. Allergy tested. Free from parabens, phthalates, sulphates, artificial colourants, mineral oil, lanolin, alcohol, gluten and petrolatum. For daily use. Gently massage a thin layer over damp skin in the morning and evening, avoiding the eye area. Rinse thoroughly with warm water. If bothersome dryness or peeling occurs, reduce application to once a day or every other day. Active Ingredient: Salicylic Acid 2% Acne. Aqua (Water, Eau), Disodium Laureth Sulfosuccinate, Bentonite, Cocamidopropyl Betaine, Sodium Cocoyl Isethionate, Glycerin, Kaolin, Charcoal Powder, Chrysanthemum Parthenium Extract, Camellia Sinensis Leaf Extract, Glycyrrhiza Glabra Root Extract, Vanilla Planifolia Fruit Extract, Yogurt Extract, Mel (Honey, Miel), Caprylyl Glycol, Tocopheryl Acetate, Xanthan Gum, Sodium Chloride, Quartz, Leuconostoc/Radish Root Ferment Filtrate, Tetrasodium EDTA, EDTA, Phenoxyethanol.